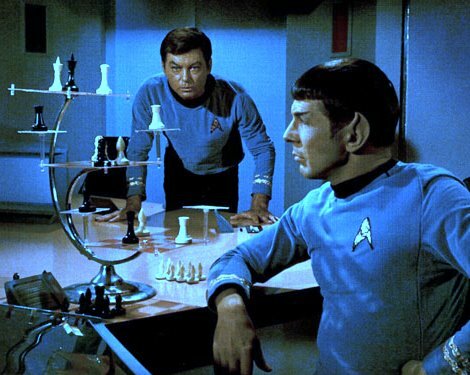 I’ve long been fascinated by Star Trek’s 3D chess. 3D chess puzzled me, not in its technical implementation—people can and have created rules for the game—but because I wasn’t sure why one would want it. Chess is a tremendously challenging game; there are hundreds of billions of possible positions after just a few moves, and even top-flight computers (to say nothing of top-flight players!) haven’t solved it. Making the game even more complex, opening it up to even more possible game states, seemed likely to make it totally unmanageable. Leonard Nimoy passed away today. That got me thinking about Spock, and about 3D chess. What’s the draw for Spock and his comrades, all of whom play this beast of a game? Here’s my theory: 3D chess is incredibly complicated. It’s so complicated, possessed of so many moves and counter-moves and openings and midgames and endgames and tactical tricks and schools of thought, that one never fully explores it. The fun comes not just from competing with the person across from you, but also from the game’s endless strategic vistas, the beautiful intricacies that appear as one plays and that, upon examination, promise still more amazing things to be found beyond them. In other words, it’s a game about exploring, not physical worlds, but strategic ones. That sounds like something Spock would play to me. RIP Leonard Nimoy, 1931-2015. LLAP.